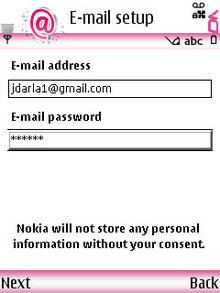 Through a kind invitation from Nokia I've been able to test out a new service called Nokia Email. Nokia Email is an application that offers native push emails to your device. Think Mail for Exchange for us non-corporate folks! Finally, a native push email solution from Nokia. Current email types supported are POP and IMAP. MSN Hotmail and Corporate Mail is not yet supported. 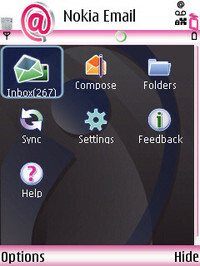 Current supported devices include: Nokia E51, E61, E61i, E65, E66, E71, E90, N73, N80, N81 8GB and N95. I've successfully installed it on the N95-3, N95-4 with no problems, but it didn't work on the N78 so don't try it. To begin you must register on the site. You will receive the application via download link to your mobile. Installation is very simple and the application can be installed on more than one Nokia. 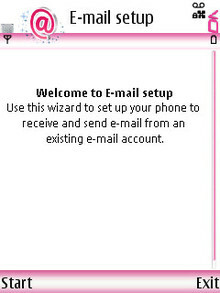 Once the application is installed the set-up automatically begins. Since the application isn't available to all devices yet I installed it on my N95-4. 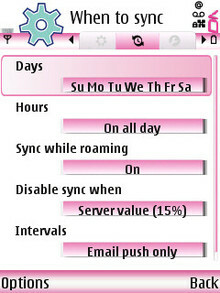 Setting up the sync schedule is easy as well and of course since we want push we want it on at all times! Remember though that data charges will apply if roaming. One of the great features of composting mail is the easy integration of the address book. Now to protect the privacy of my contacts I refrained from sharing that screenshot, but when you compose a new email all you have to do is press the center key from your device and all of your contacts appear in a scrollable list. Unlike having to switch screens to select a contact.s the easy integration of the address book. Now to protect the privacy of my contacts I refrained from sharing that screenshot, but when you compose a new email all you have to do is press the center key from your device and all of your contacts appear in a scrollable list. Unlike having to switch screens to select a contact. The inbox speaks for itself. The application also gives an option to create local folders which are stored on the device, but not synced with Gmail in this case. Since I used my Gmail account for this I appreciate the more detailed inbox for my emails. While Gmail is a great app this offers me alot more details. 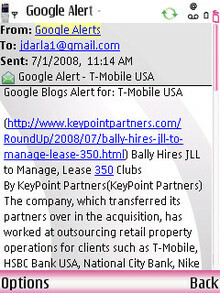 Although with Gmail you have a threaded conversation for a topic (in this case my Google alerts for T-Mobile) sometimes you miss out on mails because they are compiled into a thread instead of individual emails. This of course is a personal preference. Many great features are included in this application and so far I'm looking forward to final release. Some of you may ask "what makes this different from the built in mail client" or "does this put an inbox list on my standby screen". Those are good questions!! Hopefully soon I will have some more details and possibly some answers as beta progresses, so stay tuned and check the FAQ's. In the meantime, feel free to post any questions you may have in the comment section or leave feedback on the Nokia Email site. looks interesting darla. I'm installing it right now. Thanks for the info. Wonder if it will replace my IMAP inbox. Call me a noobie but I'm familiar with Exchange Mail. Will my email show up as read on my MacBook Mail.app if I have read it on my Nokia if I'm using this new Push email service??? When composing a new email, can you attach files of any kind? Thanks for letting us know, Darla! Really disappointed that apparently my n82 isn't supported. Going to claim I have an n95 and see what happens, because this sounds fantastic. Note: it took a LONG time for me to get a text from Nokia (like 30+ minutes) so be patient people. @Netdiva - Unfortunately, that's what happens when you have so many people signing up at once. @Pat - I'm sure more devices will be added, but I share your disappointment of the N82 not being there. Let me know how that goes. I was able to install it on my N82 by saying I have a N95. One problem is gmail is saying I am sending email from 6 hours in the future. The other problem is that email seems to stop coming to the phone after the initial sync, don't know what is up with that. So how does this differ from the native e-mail clients' built-in imap-push (which for instance works on Gmail)? any idea where the download of the application goes on the mobile, in case would like to take it on another phone? Not sure if i'm mistaken, but doesn't the built in messaging client have the exact same functionality when paired with an IMAP service (eg gmail)? I just installed this application and during the installation it uninstalled an application. Intellisync for Nokia was removed - it appears this 'new' Nokia Email application is simply a rebranded version of Intellisync that cannot coexist on the same handset. Thanks for the info. Installing right now. I just couldn't get it to work with my N95 to fetch my Gmail messages. The software installs just fine, there is nothing unusual in the setup phase, but it just can't find any messages. Any hints? The N95 version installs fine on a N82. Loading of screens takes a little more time than usual. 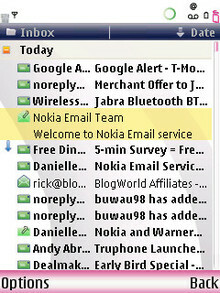 Nokia Email looks a lot like the corporate Mail for Exchange. Also (again) two icons. One for the main app and one for the settings (also available through the main app). All has a bit more eye candy. It maybe is a step in the right direction, but yet another email application next to the standard mail application. There is no integration with the standard mail app. 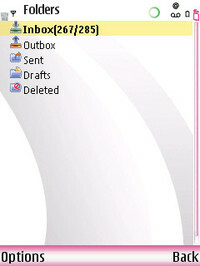 Mail for Exchange does integrate with it. Maybe a future release does. I installed it on my N95 8GB last night. Hooked it up with Gmail. I received one email from Nokia saying "welcome". 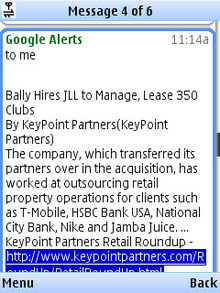 Never received any more Gmails after that on my N95, but the emails were arriving in my Gmail. I was able to send just fine from Gmail. Then I hooked it up to my mac.com email address. I had more success with that email addy. I have my Gmail set to IMAP and I believe mac.com is POP access. I installed this a few hours ago and received the messages that were in my inbox. It did not synchronize after that at all, either direction. I went back to the site linked and it seems to be down. I guess either it's overloaded or they pulled the plug while they fix something. Can you register with yahoo? Because I can't. I installed the client last night on my N82 (v 20.0.062, RM-313) and so far, even though it's slow, it works fine. I´m using the application in my N93i. In the Nokia page I told them that my cell phone was N95 and the setup was finished ok. I have installed it fine but everytime I power on the phone the application appears on the screen / auto starts. Please if you have the answer on how to stop this then please email me at [email protected] thanks. 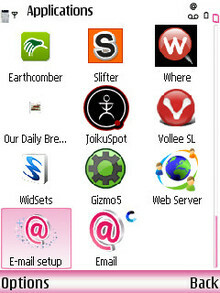 Does any of these programs clash with nokia email.